Wait, what? Senator Cory Booker, a Democratic Presidential candidate who’s for sanctuary cities just said the most absurd thing. 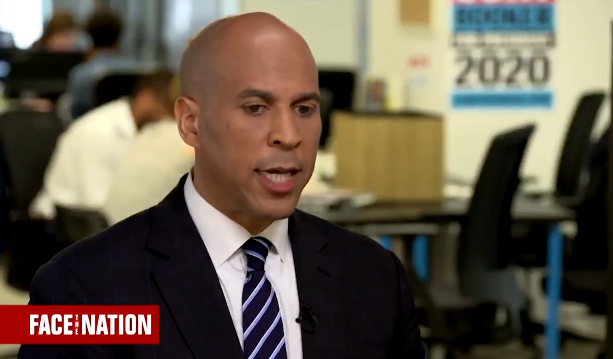 “You say friction, I say he’s trying to pit Americans against each other and make us less safe,” Booker said on Face the Nation Sunday morning. Wait a minute, did Cory Booker just use the words common sense? That’s as laughable as it gets Cory. If there is one thing Democrats don’t have it’s common sense. Isn’t it amazing how Democrats were all for sanctuary cities until they were going to have to house tens of thousands of illegals. You see my fellow Americans that was never the plan. The plan is to dump these illegals into conservative communities and cities, they don’t want them where they already have the vote. People are awake, conservatives are awake, and we say NO! You wanted to keep them, you said it was cruel to turn them back, now the Democratic party and those idiots that stand beside them can own this. Pucker up buttercups, incoming illegals to a sanctuary city near you!